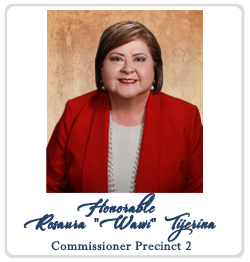 I am pleased to introduce the official Web page for Webb County, Precinct #2, for those constituents that like to keep up with ongoing projects and upcoming events. I took an oath and made a commitment, not only to the residents of Precinct #2, but to all Webb County residents, to work diligently to improve Webb County and provide a better quality of life for all our residents. I continue to maintain an open door policy and I invite all Webb County citizens to call or come by our office.